After my friend and I left Tasik Kenyir, I received an sms from Firefly saying that our flight would be delayed by 3 hours. So what did we do in that 3 hours? Well, if you have been following my blog, you would know that we went to visit mosques! Not real mosques, but just monuments actually. Although we did go to a real mosque later. 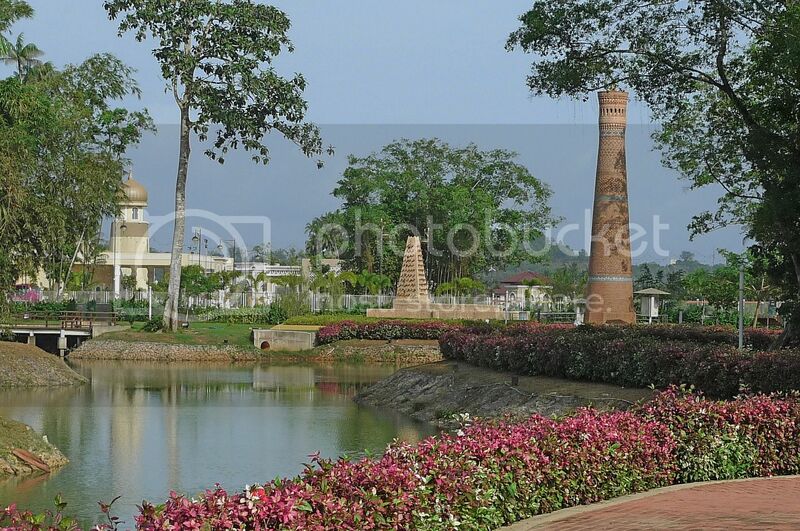 There is this place in Terengganu called Taman Tamadun Islam (or Islamic Heritage Park). 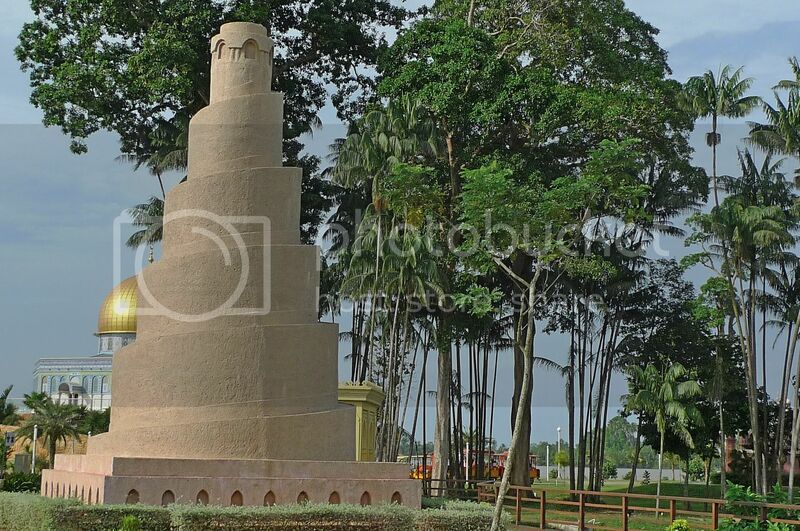 It is a park that features 21 great Islamic monuments (or replicas of mosques) from all over the world. The entrance fee is RM20, but Malaysian citizens need only to show their MyKad to get 50% discount. This sure does not look like a mosque, does it? It is actually the Minaret of Xian Mosque of China. 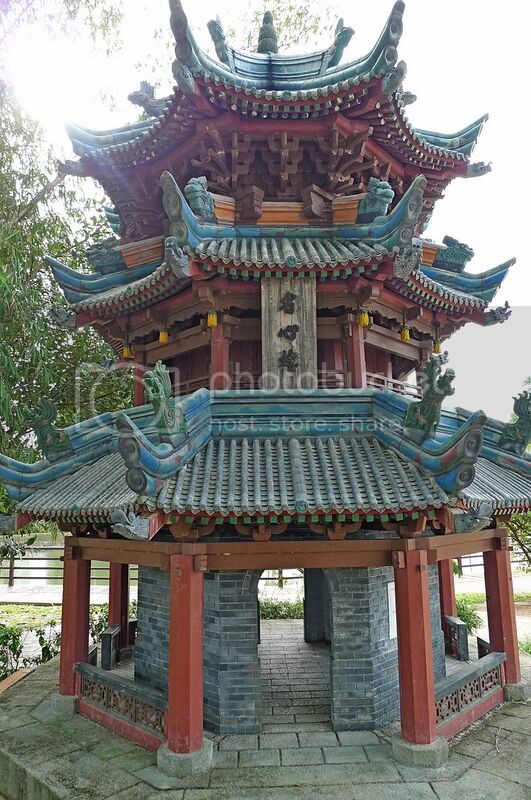 The mosque was founded in 1392 by naval Admiral Cheng Ho during Tang Dynasty. Although resembling a Buddhist temple, its grand axis is aligned from east to west, facing Mecca. 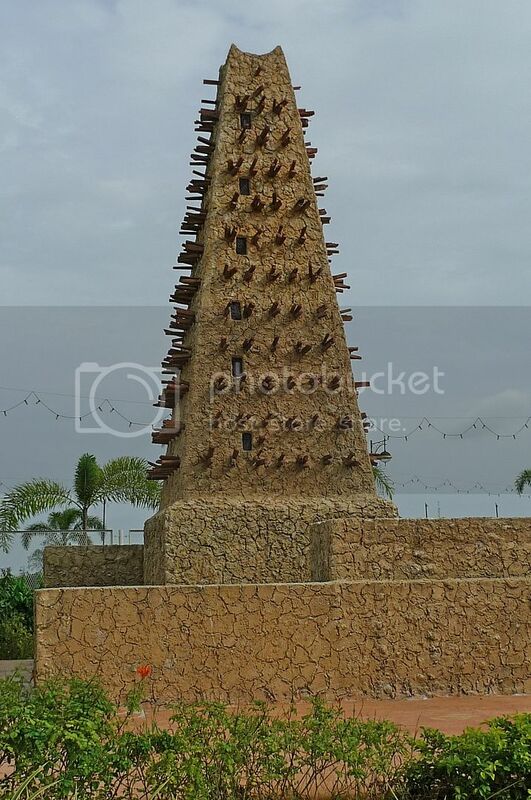 Above is the Great Mosque of Agadez in Niger which was built in the 16th century entirely from dried earth and topped by a pyramid-shaped minaret spiked with 13 rows of stakes to strengthen the structure. I have to admit that I did not really have the time to choose the best angle for my photos. These photos were the best I could do. We were trapped in a horrendous traffic jam on the way to this park and lost about 1 hour or so on the road! Taking the photos of all the 21 monuments were a challenge. We were actually rushing from one monument to the next! Since showing all 21 monuments would make this post too long, I have decided just to highlight a few interesting ones. There was a small lake in the middle of the park. It's a pity we did not have more time to enjoy the scenery! 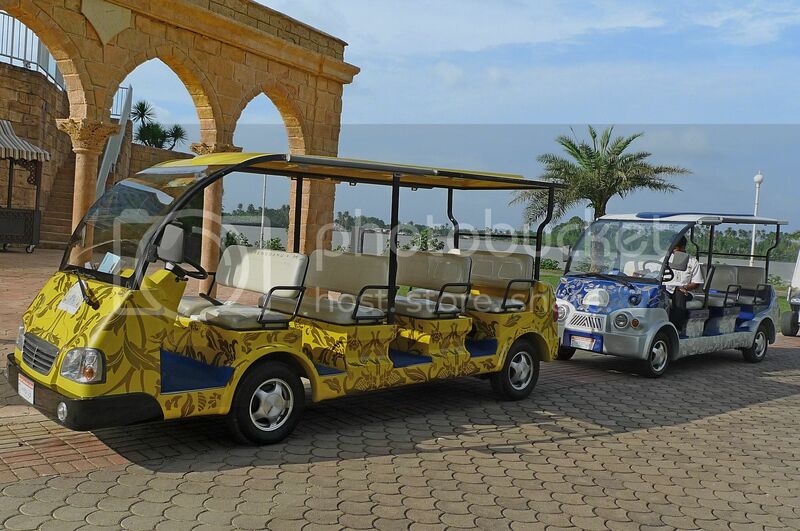 Oh, I noticed there were buggy rides too! 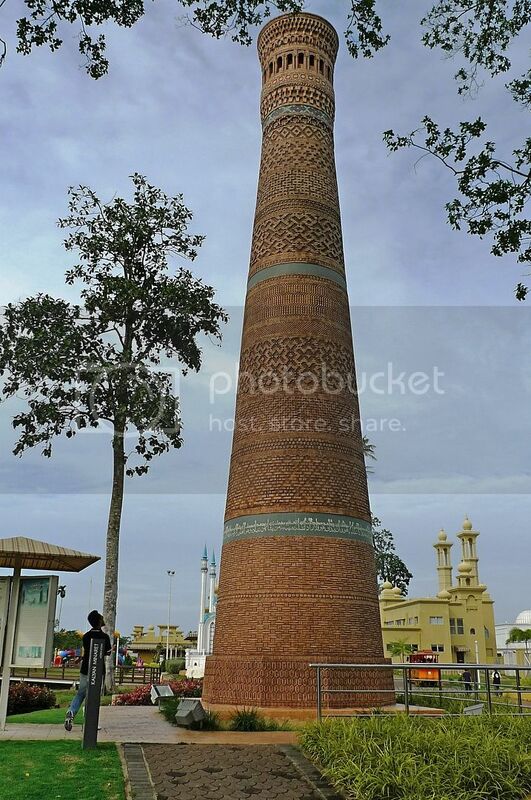 Below is the photo of the Kalyan Minaret of Uzbekistan. Made from baked bricks in 1127 A.D., it was built twice because the original tower fell down due to shoddy works! Now isn't that interesting! This is the Mohamad Ali Mosque of Egypt. Designed by a Greek architect, it was built in 1246 A.D. and was named after the Egypt King who governed Eygpt for 45 years. 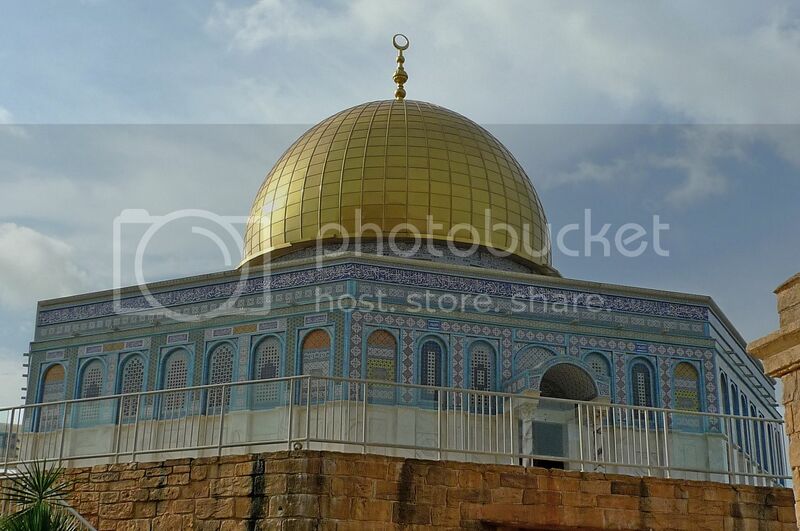 Known as Dome of The Rock, the mosque below was built in 602 A.D. in Palestine. It enshrines the Sacred Rock and commemorates the Prophet Muhammad's ascension to heavens to visit God. If you do not wish to fly over to India for the magnificent Taj Mahal, you can actually see the smaller version at Taman Tamadun Islam. The Taj Mahal was built in 1631 by Mughal Emperor Shah Jahan in memory of his wife Mumtaz Mahal. It incorporates Persian and earlier Mughal architecture. 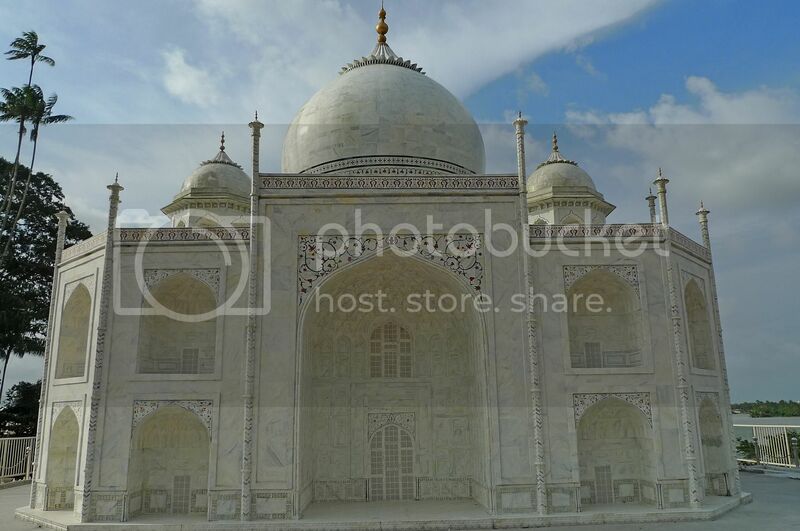 Shah Jahan promoted the use of white marble inlaid with semiprecious stones in the building of Taj Mahal. The Great Mosque of Samarra in Iraq was built entirely of bricks and clay in the 9th century and was at one time, the largest mosque in the world. The minaret called The Malwiya Tower, is a vast spiralling cone 52 metres high with spiral ramp. Definitely a unique looking mosque in my opinion! One look at the Kudus Minar Mosque and you can guess it's from Indonesia because of the meru style minaret of mixed Hindu and Javanese architecture. It was built in 1549 by a famous Muslim guru Sunan Kudus and is located in Kudus District in Central Java. 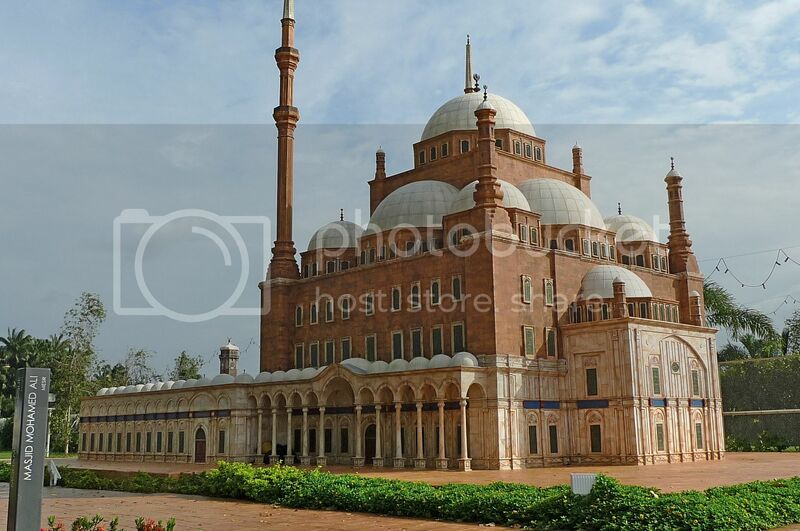 Lastly we have the Pattani Mosque of Thailand. Resembling the Taj Mahal, this mosque was built in 1954 and is the biggest and most beautiful mosque in Thailand. If you like to see all 21 monuments, click HERE. After seeing all these scaled down versions of mosques from around the world, we rushed off to see a real mosque, one that is made of crystals! 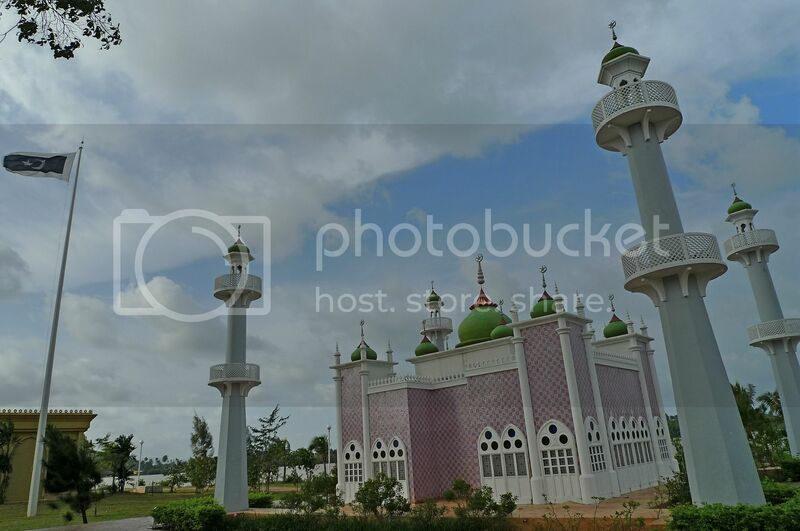 Called Masjid Kristal (or Crystal Mosque), it is located just a short ride away from the monuments. 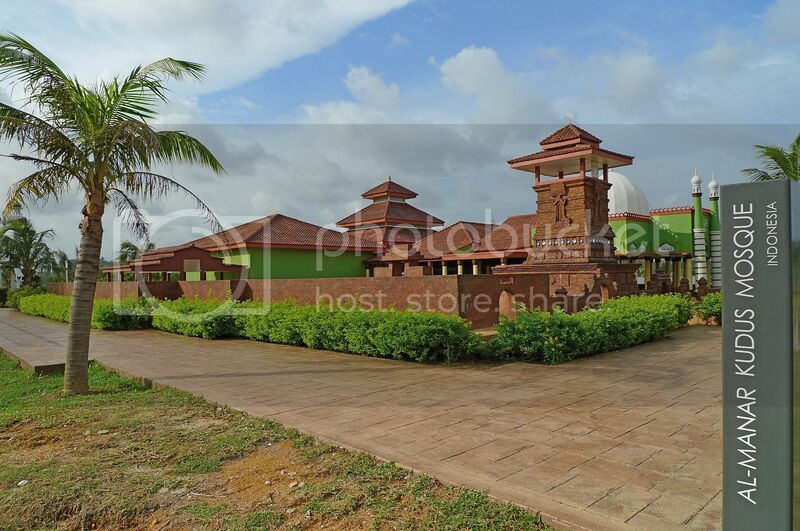 Constructed in 2006, this mosque was officially opened on the 8th February, 2008. We did not go into the mosque but just took photos from outside. I did not find the mosque that beautiful as expected. Could it be that it was not properly taken care of? 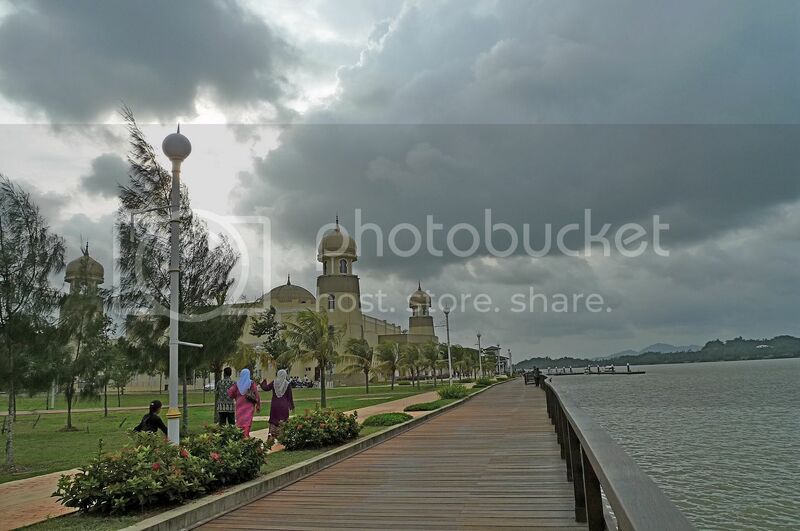 Sitting on top of the Terengganu river, the mosque was supposed to look majestic, but the sight of rubbish at the base of the mosque really put me off. I have cropped the bottom part of the photo above to spare you the view of those filthy rubbish. Actually, the view opposite the mosque was better. Dark clouds were looming up above the sky and the wind was blowing quite strongly. Looked as if a storm was brewing. I really enjoyed standing there. Unfortunately, it was time for us to go. We had to catch the flight back to KL. The taxi driver had told us about another famous mosque in Kuala Terengganu called Masjid Terapung (or Floating Mosque). 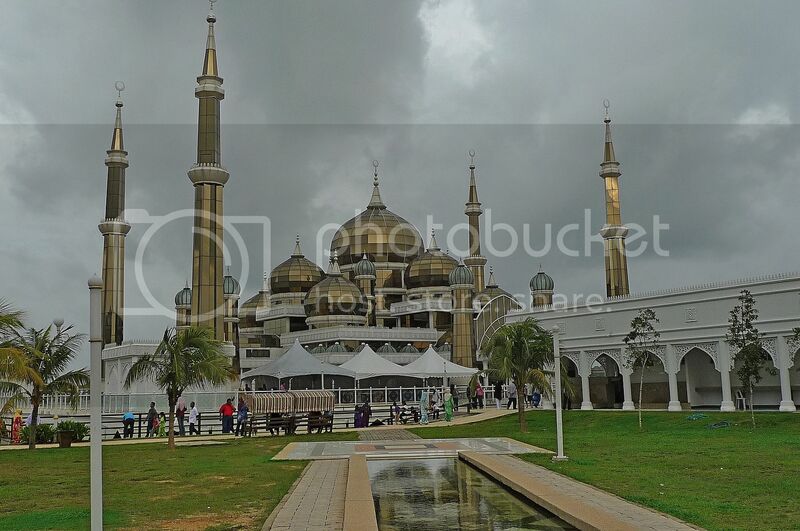 Maybe I will go there if I ever visit Kuala Terengganu in future. NOTE : This is the end of my Lake Kenyir posts. If you have missed any of my Lake Kenyir posts, feel free to read them HERE. Chop! haha.. Just finished watching the Netherlands vs Uruguay match. Too bad for Uruguay. Yeah, great pictures, Foong. Thanks for sharing. It's interesting to note that a place of worship (here, mosques) do not need to reflect the place of origin of the religion. Not all go for the "Arab" look all the way. Why got so bad jam in KT one? Accident? Is there something wrong with blogger? My comments are not showing up. The real mosque is quite magnificent. Eh... but no replica of the Masjid Ubudiah in my hometown Kuala Kangsar? ahaks i know i am too late, but i am just going to be a sportsman saying "CHOP!!" 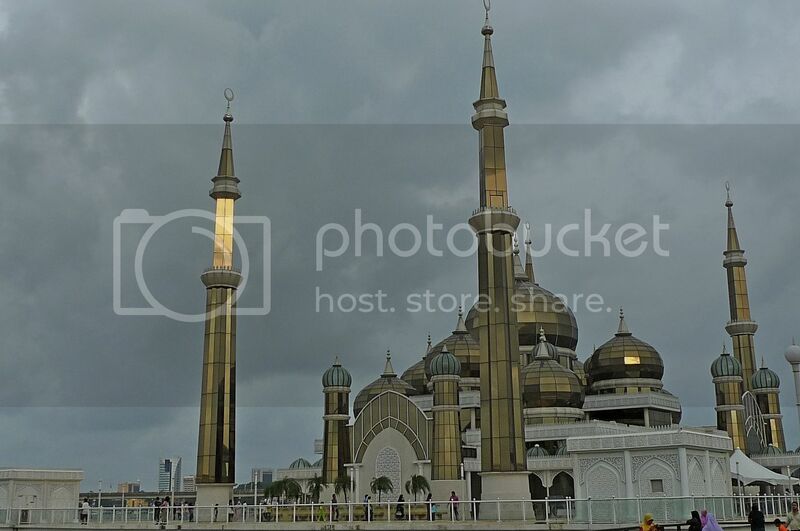 Owh, i ve never been to Tamadun Islam, but i ve been to Masjid Terapung couple of years back. have never been to those mosques you posted, except only Taj Mahal that i visited back in year 2006..
but wait, Taj Mahal is actually not a mosque.. it's the tomb for the queen of the mogul king..
nonetheless, Taj Mahal is really a great and magnificent structure.. very beautiful, i stayed there and don't feel like leaving.. it has a certain charm that attracts you..
oh, didn't know there's such a nice Crystal Mosque in Terrenganu!! very impressive design!! but why is it called the Crystal Mosque?? i don't think i see any crystal on the building?? hehe..
anyway i think the Crystal Mosque is a lot more beautiful than the National Mosque and the Shah Alam Mosque..
wow, tamaddun islam subject can be taught virtually now, not like those days. lovely, lovely mosques. i had a temple-hopping and church-hopping but never mosque-hopping. thanks for sharing. Beautiful,fantastic and lovely shots ! !Great post !! 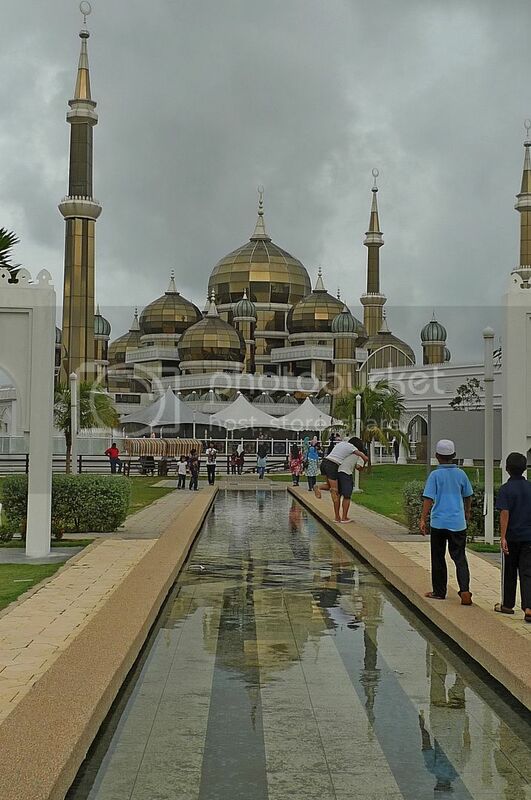 Din know Terengganu have such beautiful structures. I'm in a mess, can't read ur blog rite now. Just drop by to say hello and will hop back laterz. Shiats.. something's bothering me... Will be back. the white color one nice..
woooooo, tamadun islam, I got an A2 in Sejarah. very very nice structures! I will definitely go gaga with my camera if i was there! those are such lovely mosques. Thanks for this beautiful post. This is indeed one of the best posts I have ever found in your blog. The Crystal Masjid by the side of the river is very attractive. The scenic beauty of the place is very charming. Thanks once again. Bye. 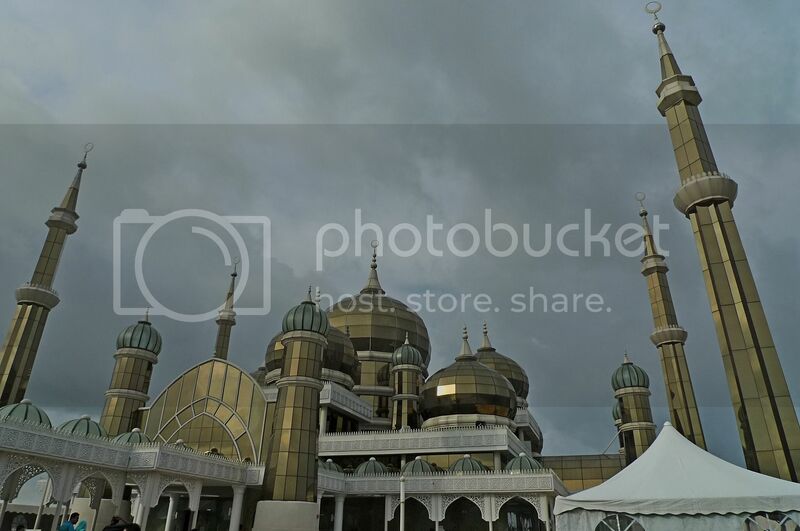 Thanks for sharing such amazing photos with us.I didn't know that mosques over there could be so unique. Very nice and informative post. nice photos of the masque. Very nice.